The tranquil scenery of Jalan Mempurong. 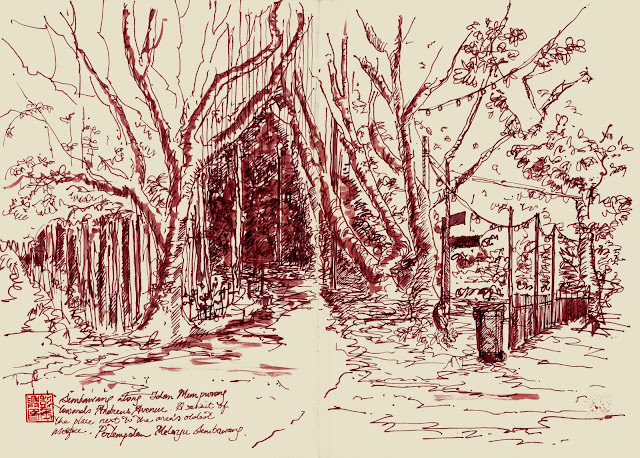 While fellow-sketchers focussed on the local landmark of Masjid Penempatan Melayu Sembawang, I decided to turn my attention to the tranquil scenery of the road that leads to the mosque and subsequently the beach overlooking Johor Bahru, the road that is named Jalan Mempurong. The Bottle Tree Village is located at the end of Jalan Mempurong and is known for its Bottle Trees (Brachychiton rupestris) flown in from Queensland, Australia. Apart from these, other Australian flora can be spotted in the surroundings. i am curious about your name seal - what do the characters mean?